Studies have identified differences between the gut microbiota of colorectal cancer (CRC) patients versus healthy individuals. In this review, we assess the scientific literature to determine if gut microbes should be considered causal, co-varying, or a necessary but not sufficient agent in CRC development. Oral bacteria may influence CRC susceptibility. Colonic biofilms in both sporadic and hereditary CRC suggest these bacteria are present in early neoplasia. Pathogenic drivers and opportunistic passenger bacteria may underlie direct effect of the gut microbiota on carcinogenesis. Members of multiple bacterial taxa have been implicated in CRC tumorigenesis and progression, with distinct mechanisms of action described for each. Individual bacterial organisms found in the colon are likely not enough to explain CRC development and progression. The entire colonic environment, including genetic factors, local tissue inflammatory state as well as dietary components may influence the way epithelial cells respond to the presence of certain bacteria. Longitudinal, human intervention studies are needed to completely clarify complex interactions in the colonic environment and specific causative pathways between the microbiota and CRC. The authors would like to thank Drs. Christina Hester and Ishfaq Ahmed for thoughtful discussion. Kristina M. Bridges, K. Allen Greiner, and Shahid Umar declare they have no conflict of interest. • Hannigan GD, Duhaime MB, Ruffin MT, Koumpouras CC, Schloss PD. Diagnostic potential and interactive dynamics of the colorectal cancer virome. MBio. 2018;9(6). https://doi.org/10.1128/mBio.02248-18 Presents a novel model for predicting CRC based on bacteriophages present in the gut and presents evidence that bacteriophages may impact CRC progression by modulating gut bacteria. Bhutiani N, Li QS, Anderson CD, Gallagher HC, De Jesus M, Singh R, et al. 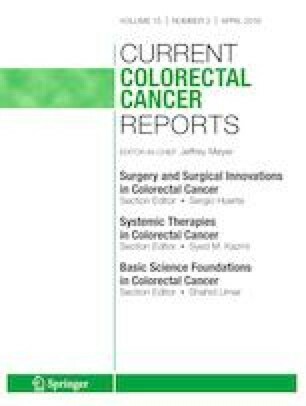 Enhanced gut barrier integrity sensitizes colon cancer to immune therapy. Oncoimmunology. 2018;7(11). https://doi.org/10.1080/2162402x.2018.1498438. Qamar TR, Syed F, Nasir M, Rehman H, Zahid MN, Liu RH, et al. Novel combination of prebiotics galacto-oligosaccharides and inulin-inhibited aberrant crypt foci formation and biomarkers of colon cancer in wistar rats. Nutrients. 2016;8(8). https://doi.org/10.3390/nu8080465. Sheflin AM, Borresen EC, Kirkwood JS, Boot CM, Whitney AK, Lu S, et al. Dietary supplementation with rice bran or navy bean alters gut bacterial metabolism in colorectal cancer survivors. Mol Nutr Food Res. 2017;61(1). https://doi.org/10.1002/mnfr.201500905.